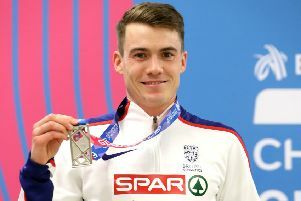 The 26-year-old double European medallist came seventh in the 1500 metres at the Diamond League meeting in 3:33.61, breaking John Robson’s Scottish record that had stood untouched since 1979 by 22-hundredths of a second. Lynsey Sharp also underlined her form with sixth place in the 800m, producing her season’s best with a time of 1:58.01. But there was no stopping Rio 2016 gold medallist Caster Semenya with the South African maintaining her unbeaten streak with a lifetime best of 1:55.27. Pitreavie’s Eilidh Doyle took fourth place in the 400m hurdles in 54.75 secs behind the USA’s Kori Carter. Meanwhile, at the European Junior Championships in Grosseto, Holly McArthur made it seven personal bests in seven events of the heptathlon to finish 11th with 5687 points, moving the Edinburgh AC hope into second place in the all-time Scottish rankings. And it also gave her the qualifying standard for next year’s Commonwealth Games. “At the beginning of the season, it felt like such a big number,” she said. “I knew it would have to be the perfect day to get that store but I’m delighted to get it.” Club-mate Alisha Rees eased into tomorrow evening’s 200m semi-finals as the fifth-fastest in the heats in 24.06 secs.